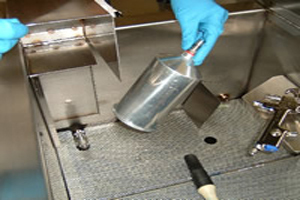 The Bonny Marlin System® is a Non-Hazardous paint gun cleaning and recycling system. It produces no Hazardous Waste, uses an EPA recognized, Non Hazardous solution to clean the paint guns and reuses the solution over and over. 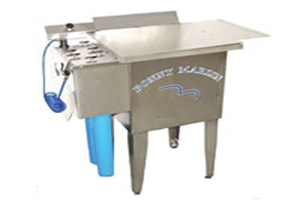 The shop owner will no longer need to use Lacquer thinner or dangerous electric thinner recyclers. 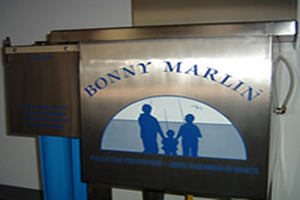 The Bonny Marlin is air operated and can be installed in the mixing room, greatly decreasing fire and health risk. The owners of Scuderi Auto Body in Rockville, Md. 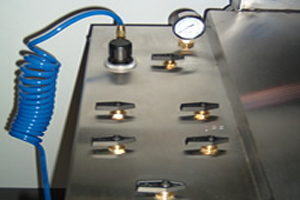 developed the system in March of 2002. The owners had an urgent need to find an alternative approach to paint waste management, eliminate the hazardous waste they were generating and eliminate the use of lacquer thinner by their employees. The Bonny Marlin Paint Gun Cleaning & Recycling System | The Future in Paint Gun Cleaning & Recycling Systems. © 2003-2019 by Bonny Marlin, a leading manufacturer of paint gun and spray gun cleaning systems for auto body shops. For more information please contact us at info@bonnymarlin.com or (717) 292-3579.